Custom synthesized peptides from GenScript are manufactured under strict high-level quality control processes. 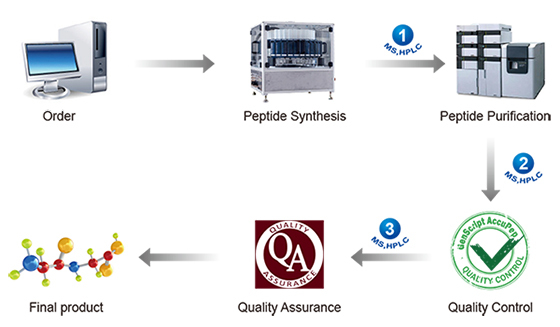 Our ISO 9001:2008 certified, Total Quality Management (TQM) platform ensures that each custom peptide is triple checked for quality via both mass spectrometry (MS) and high performance liquid chromatography (HPLC) analyses after each step during peptide purification and quality control (QC) procedures. As the final step in our TQM platform, we perform additional quality assurance (QA) procedures for every custom peptide to further guarantee the delivery of high-quality peptides. For additional customized quality control services that can ensure peptide reliability and reproducibility view our AccuPepQC+ webpage. View our ArgonShield™ packing service webpage to see how GenScript maintains the integrity of your custom peptides from our lab to yours. Your peptide QC report consists of MS and HPLC analyses. 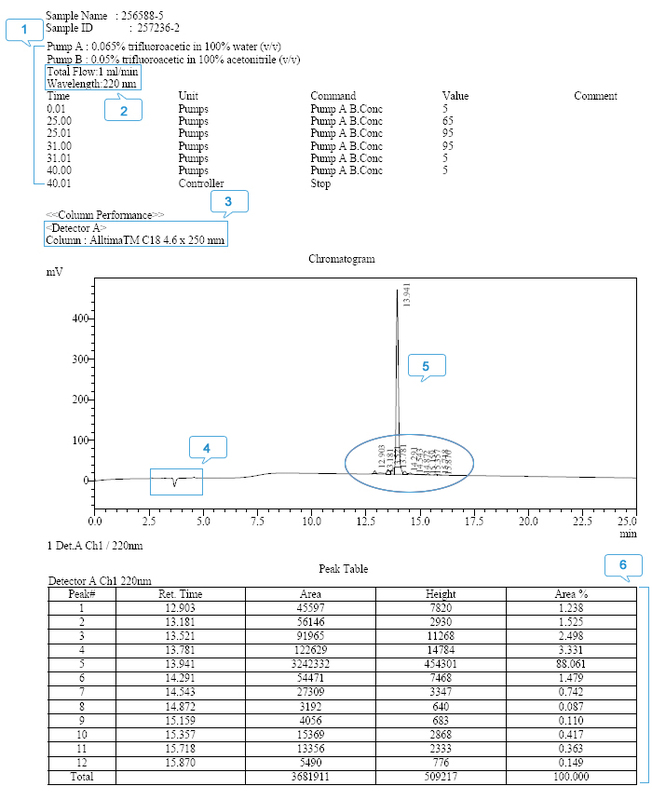 The guide below will help you understand each analytical report, and how to tell if a quality analysis of your peptide was performed. Even after multiple rounds of purification, small amounts of impurities may still exist in the final peptide product. Therefore, GenScript uses reversed-phase high performance liquid chromatography (RP-HPLC) to analyze the purity of each custom peptide. RP-HPLC is a widely used analytical tool, in which the components of a complex mixture can be efficiently separated. The analyte mixture is usually dissolved in water, which is sometimes also mixed with an organic solvent or an acid to assist dissolution prior to RP-HPLC analysis. The analyte is carried by a mobile phase consisting of water and an organic modifier, which is pumped through a column packed with a stationary phase which usually is a number of small diameter particles consisting of carbon chains of a specified length on the surface. As the mixture is pumped through the column, the analytes (in this case your custom peptide and small impurities) adsorb to the hydrophobic surface of the stationary phase. As the percentage of organic modifier in the mobile phase is gradually increased, the analytes desorb into the mobile phase. Desorption of a specific analyte is based on its intrinsic properties, thus each analyte will remain in the column for a specific amount of time, called the retention time. Since peptide bonds maximally absorb UV light at the wavelength of 220 nm, a UV spectrometer is commonly used in RP-HPLC to detect a peptide as it elutes from the column. The detection signal is converted to a visual graph called a chromatogram, which is the plot of UV absorbance vs. elution time. High resolution of eluted peptides is mainly based on the selection of columns and the organic modifier, especially its elution gradient. The height of a theoretical plate of each column used in the manufacture is regularly checked, and different gradients are established to separate varying peptides. Both processes are aimed at maintaining high resolution of every custom peptide. GenScript takes special care in developing RP-HPLC protocols to ensure the most effective separation and the accurate purity determination of your custom peptides. "HPLC mobile phase and its elution gradient: The peptide separation is highly sensitive to the selection of organic modifier and its elution gradient. Absorption wavelength: The wavelength of 220 nm is chosen for UV detection since peptide bonds (amide bonds) maximally absorb UV at this wavelength. Column type and dimensions: The selection of the column plays an important role in RP-HPLC analysis. A C18 column is usually used to separate peptides. Dead time: Indicates the amount of time required for an unretained solute such as the organic solvent or the acid from the column. Thus, the organic solvent nor the acid contributes to the area of the target peptide peak. Major component elution peak (the target peptide): Shows the retention time of the target peptide as well as the impurities. The integrated peak area is used for the purity calculation. The baseline should be smooth, indicating that the system is stable. The vertical lines separate the partially overlaid peaks and denote the peak area of the target peptide. Peak table: All peaks shown in the chromatogram are listed according to their retention time. The Area % of the target peptide is used to calculate the peptide HPLC purity. We use electrospray ionization mass spectrometry (ESI-MS) analysis to confirm the molecular weight of the target peptide. ESI-MS is an analytical tool used to study macromolecules, where the mass-to-charge ratios (m/z) of all ionized analytes are respectively determined. As one of the widely used soft ionization techniques, electrospray ionization produces a whole charged ion from the solution of analytes without fragmentation of the macromolecule, which provides a reliable and accurate way to measure the molecular weight of the macromolecule. Generally peptides can be ionized into multiple-charged states, either positively or negatively, depending on the number of basic and acidic residues in the sequence. The ionized peptides are then transferred into a mass analyzer such as a quadruple or a time-of-flight (TOF), which can separate all charged ions according to their m/z. All these isolated ions are respectively detected by an ion detector such as an electron multiplier and finally are converted into a visual graph called a mass spectrum, which is the plot of ion abundance vs. m/z value of all detected ions. The mass spectrum displays all detected m/z signals and the relative intensity of the ions, which is relative to the highest m/z peak. The highest peak is set as 100%. For most peptides, the mass spectrum displays more than one m/z peak representing a series of charge states. Theoretically the m/z values of these peaks should all result in the same calculated molecular mass, however, calculations from these peaks actually vary with each other slightly due to limited resolution of the instrument. In our MS report, the calculated molecular weight from the most abundant m/z peak of the analyte is utilized to largely eliminate variations from the instrument. GenScript performs regular cleaning and calibration of mass spectrometers to ensure the mass accuracy and reproducibility of MS analyses. "Ionization mode: Either positive or negative ionization mode can be used for the peptide analysis. Instrument settings: The optimized parameters for ESI ion source. 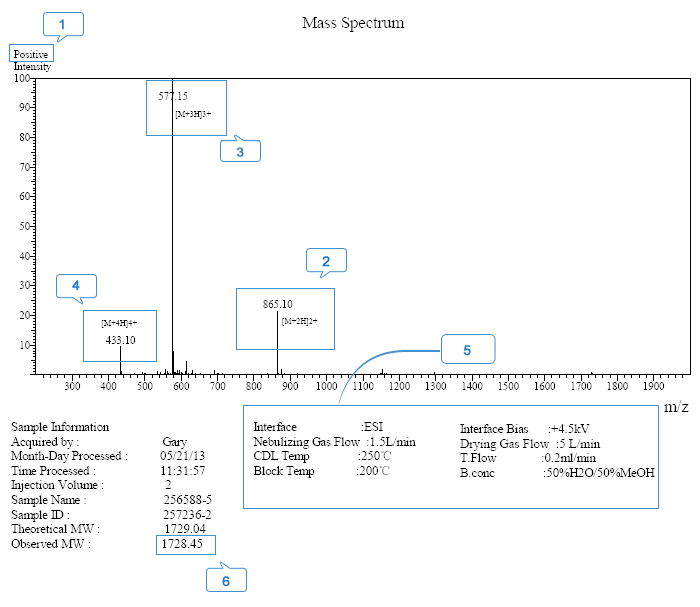 Measured MW by mass spectrometer: The MW calculated from the most abundant m/z peak of the analyte.